The agreement will see both systems the system.” The USCG Type Approval Certi? cate for their size and required capacity to maintain ballast op- installed on a 155,000-barrel capac- the PureBallast 3 family was issued on December 23, erations. It can also prove to be complex in integrating ity clean products barge, with delivery 2016, making Alfa Laval one of the ? rst suppliers with the system with existing systems and congested ma- scheduled for August 2018. It is, accord- chinery room spaces,” explained David Stocks, presi- a USCG-approved system. 3GA Marine Ltd has teamed up with Alfa Laval to surrounding systems which signi? cantly reduces re? 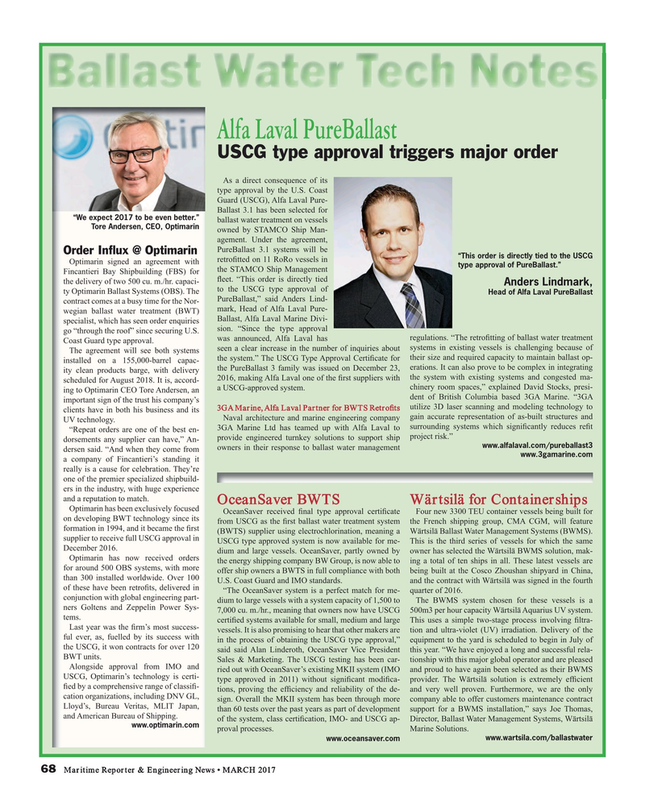 t “Repeat orders are one of the best en- provide engineered turnkey solutions to support ship project risk.” dorsements any supplier can have,” An- www.alfalaval.com/pureballast3 owners in their response to ballast water management dersen said. “And when they come from www.3gamarine.com a company of Fincantieri’s standing it really is a cause for celebration. They’re one of the premier specialized shipbuild- ers in the industry, with huge experience and a reputation to match. U.S. Coast Guard and IMO standards. and the contract with Wärtsilä was signed in the fourth of these have been retro? ts, delivered in “The OceanSaver system is a perfect match for me- quarter of 2016.
conjunction with global engineering part- dium to large vessels with a system capacity of 1,500 to The BWMS system chosen for these vessels is a ners Goltens and Zeppelin Power Sys- 7,000 cu. m./hr., meaning that owners now have USCG 500m3 per hour capacity Wärtsilä Aquarius UV system. tems. Lloyd’s, Bureau Veritas, MLIT Japan, than 60 tests over the past years as part of development support for a BWMS installation,” says Joe Thomas, and American Bureau of Shipping.